Take advantage of the warm weather and go on some longer backpacking treks! In this post, we catch up with Angel & Michelle on the permits, fees, and regulations for the popular backpacking sites near the Bay Area. Angel & Michelle are the duo behind Anywhere at Home, a blog for adventurous, outdoors-y people, and also people who aren't so experienced in the outdoors but want to start! Check out their blog here, or follow them on Twitter @Anywhereathome! We can read a billion guides about all the best gear, which trails to take, and what to pack. But the first thing you need to know to start backpacking is where you’re going and what permits you need to get in. Within a couple hours of San Francisco, backpackers can find National Parks, Open Space Preserve, State Parks, and land managed by the Bureau of Land Management (BLM land) to backpack in. Here are just a couple places to get you started. Not all National Parks allow backpacking. Luckily, some of the best do. Each park has different fees, regulations, and permit systems, so be sure to head over to the website or talk to a ranger to learn more about planning your backpacking adventure. If you have particular trailheads (especially near the Valley area) or you want to include Half Dome in your hike (see our Definitive Guide to Hiking Half Dome) or will be visiting during a popular holiday, you will want to start planning far in advance. Luckily, you can make reservations 24 weeks in advance! For more information on the application process, click here. If you are a last minute planner, you can still try to make a reservation for a less popular trailhead. This PDF is updated regularly and will help with last minute planning. With a reservation, be sure to stop at a Wilderness Permit Station to pick up your permit before 10:00 am on the day of your hike. If you are a really last minute planner determined to spend a few days in the Yosemite wilderness, head into a Wilderness Permit Station the day before your intended entry date. You will have to be more flexible with your entry trailhead, but even so, it’s still possible to get a permit. Backpacker campgrounds are available for the day after and day before your trip. From San Francisco, Point Reyes is one of the easiest spots to get to. Since it’s only a ~2 hour drive from San Francisco, the hike-in campsites in the park are extremely popular. Reservations are suggested, and can be booked through Recreation.gov. Once you’ve obtained a reservation, be sure to head into the Bear Valley Visitor Center the day of your trip to pick up your permit. If you don’t have a reservation and are hoping to get in day of, be sure to arrive during visitor hours to the Visitor Center to receive a permit. There is no self-registration available after hours. Backpacking Fees in Point Reyes: $20 per night, per site for groups of up to six people. There is only one option for backpackers in the preserve, the Black Mountain Backpack Camp at Monte Bello Open Space Preserve. There are only four campsites (for up to four backpackers) and a group site nearby. It is best to check campsite availability and submit a permit application at least one week in advance. Backpacking Fees at Monte Bello Open Space Preserve: $2, per person, per night. Backpacking is possible in many California State parks. Most of these sites are primitive, with vault or pit toilets and water if you are lucky. Reservations are required for some state parks, so check below, or head over to the state parks site for more information. This park is the largest state park in northern California, and yet surprisingly empty, making it perfect for last minute trips. The endless hills and silent vibe make it worthwhile, and the well-connected trails means backpackers of any fitness level can plan a trip that suits their needs. Plan a one or two day trip, or even a week long trip, there is plenty to see. Reservations aren’t required, instead, fill out a permit at headquarters, or at the entrance you intend to use. When planning your trip, consider whether you wish to visit the western or eastern sections of the park. In the Western area (near park headquarters), backpackers are expected to camp in designated campsites, available on a first-come, first-served basis. In the eastern zones, backpackers can chose to camp anywhere. Backpacking fees at Henry W. Coe: Camping is $5 per person, per night. A vehicle fee of $8 or $6 dollars per night (cost dependant on the entrance) is also required. There are a handful of primitive trail camps within the Santa Cruz Mountains, at Castle Rock, Portola Redwoods, Butano, and Big Basin Redwoods State Parks. Since these parks all connect, it’s easy to plan a trip within multiple parks. The Bay Area’s backyard, this trail system is extensive, and a trip could include hiking through the redwoods, hours along a skyline ridge, or even a hike out to the Pacific Ocean. A multi-day trip in the Santa Cruz Mountains is going to require some advanced planning. Reservations are required, and camping is only allowed in the designated camps. It’s best to schedule quickly for any weekend or holiday trips. Call up to two months in advance on the first day of the month, with your itinerary ready. A Note about Castle Rock Trail Camp: This is the only camp in the system available on a first-come-first served basis. If you are a last-minute planner and want to visit the Santa Cruz Mountains, head here for a one-night backpacking trip. When traveling, be aware that the trails are closed after sundown. It’s necessary to schedule your time to make it to camp before dark, and head out the next morning after dawn. Backpacking Fees in the Santa Cruz Mountains: Trail camps are $15 per campsite per night, plus an $8 reservation fee. This sweet spot of land is barely visited, although it’s a great place to camp near Pinnacles National Park. For backpackers, head past the trailhead campsites through sloping chaparral to a secret waterfall. Managed by the Hollister Field Office, there are primitive campsites along the trail, but dispersed camping is allowed anywhere. 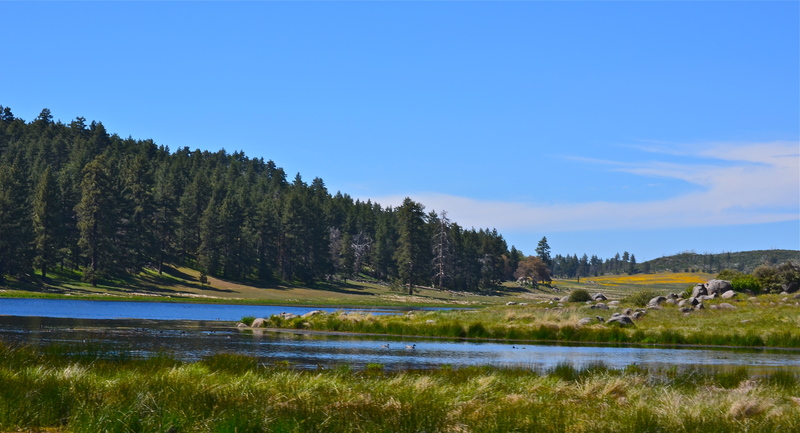 Backpacking Fees in Laguna Mountain: None! This is a great two day, last minute, cheap backpacking trip only a couple hours away. Where else will you end up? Hopefully these places will give you some inspiration to plan your first or next backpacking trip. For other ideas, check out these posts on all the backpacking places near the Bay Area and some favorites from a very experienced backpacker! And don’t forget, if you don’t have all your gear, get it from Last Minute Gear. We rented a tent and sleeping pads on our trip into Desolation Wilderness (another great spot nearby) and were thrilled to be sleeping warm in the snow. You can read our photoessay about that trip here! Finally if you have any comments or ideas on other spots, leave us a note in the comments below! Cover photo by Angel & Michelle with Anywhere at Home. Other photos by James Dong, The Late Bloomer Hiker, David Baron, Miguel Vieira. Licensed by Creative Commons.